By this stage, we are no longer taking any notice of the weather forecast. I would like to place on record however that no Carol, we did not experience the best day of the week with sunshine everywhere. We leave the van promptly and head back across Wrynose Pass and continue on to the Hardknott Pass. There are various notices warning us that this is pretty much unsuitable for almost any form of traffic but it sounds like fun. A very narrow winding road with hairpin bends at a gradient of 1:3; who needs theme parks? I can’t help wondering how long it must have taken to build all the miles of drystone walls that we see and how long they have been there. Chris is dressed for the weather forecast, a mistake. I have been a little more cautious but I soon change my mind about getting out of the car to look at the remains of the Roman bathhouse that was attached to a fort in the middle of the pass. This ‘unmissable’ site will have to remain missed, or at least only viewed from a distance. Apart from the drizzle, there is a very keen wind making the conditions raw. One can only have sympathy for the Roman soldiers, fresh from Mediterranean climes, who were stationed at what is believed to have been called Mediobogdum. The Romans were allegedly responsible for this road, which connected their fort at Ambleside to the coast at Ravenglass. The twists and turns are certainly not reminiscent of the Romans. With perfect timing, we arrive at the prosaically named Boot to board a train at Dalegarth Station. 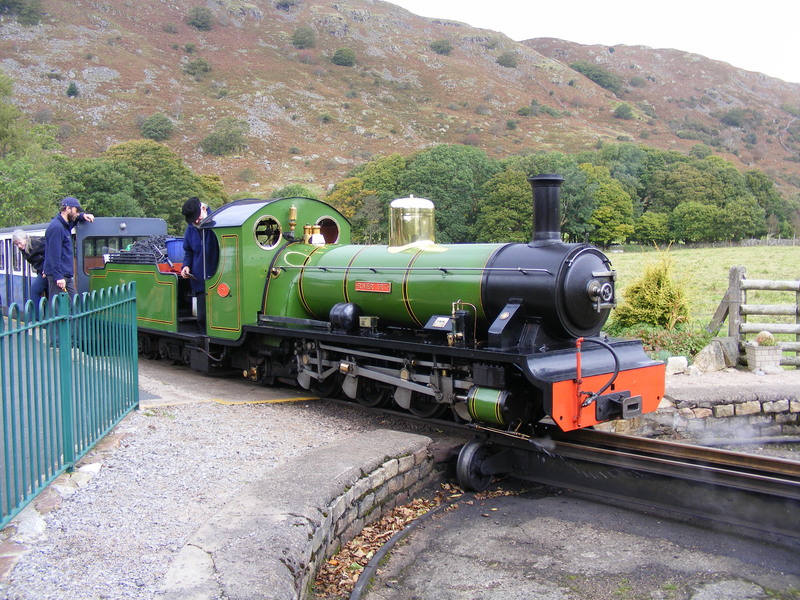 This is the terminus of the Ravenglass and Eskdale Steam Railway. Always a sucker for a preserved railway, we plan to take the return trip to Ravenglass, the only coastal town in the National Park. A three foot gauge railway was built on this route in 1875, primarily to carry iron ore. This short-lived line was replaced by a 15 inch railway in 1913. It is one of the oldest and longest narrow gauge railways in the world. As predicted by the timetable, our outward journey is by diesel locomotive. We can choose between an open carriage, a fully enclosed option or an open carriage with a roof. With an eye on the darkening clouds, we opt for the roofed open carriage. Chris is finding this a tad chilly but I am putting on a brave face and wishing I hadn’t left my 1646 spun and knitted hat in the van. I am pleased that our return journey is accomplished courtesy of a steam engine, the River Irt. Built in 1894, this engine is the oldest narrow gauge engine in the world. This time we succumb to the luxuries of first class; padded seats and an enclosed carriage. Back at Boot, we drive across Eskdale to Wast Water, another on the ‘unmissable’ list and billed as ‘Britain’s favourite view’. From here we can see Scafell, if only we could work out which of several peaks it is. Chris braves the elements in his three quarter length walking trousers to help a damsel in distress who is unable to lift her bike over the stile. 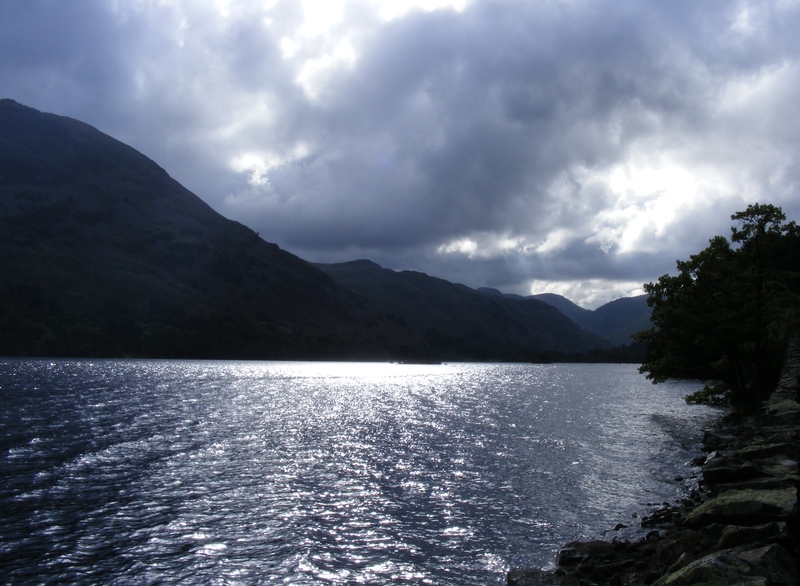 Despite the weather conditions, there are several divers in Wast Water. There is also a line of orange floats, which look like something out of an extreme challenge. No one is trying to cross the lake by leaping from float to float though. It turns out that these are to facilitate getting an electric cable across the lake. We drive back out to the coast, head northwards and return to the van in a large clockwise sweep, taking us past Helvellyn, also not identifiable, Grasmere, famous for Wordsworth and Ambleside. Rashly believing the weather forecast, which stated that today should be rain free, we set out for what might be described as a proper walk. Why we should think today’s forecast should be any more accurate than those for preceding days I have no idea and there are squally showers. 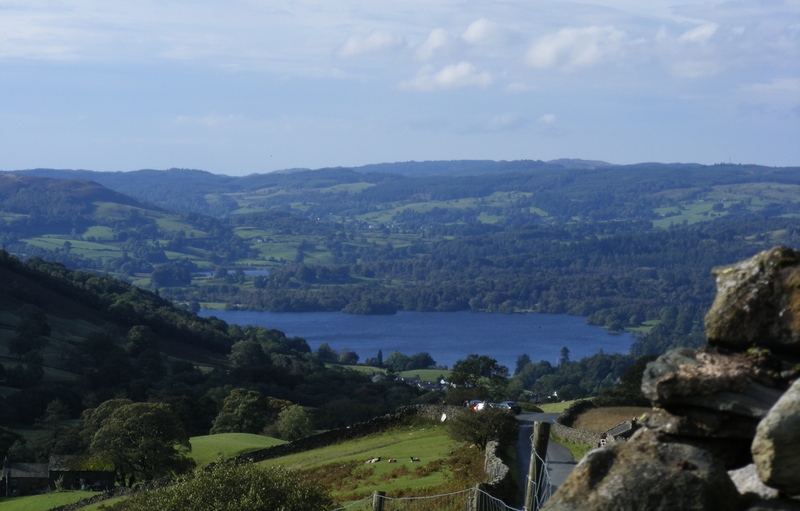 We are planning on taking a walk recommended by the guide book; a four mile circular walk from Elterwater, around Loughrigg Tarn. Maps often prove handy on occasions such as this and we have plenty. Forethought means that I have arranged to borrow several maps from Becca and Graeme prior to the trip. The only snag is that none of them cover this area. Based on our experience so far, which suggests that things are pretty well signed, we hope to be able to manage without. We avail ourselves of the National Trust car park. We have probably recouped our life membership fee on car parking savings for this trip alone. The walk we were planning seems somewhat devoid of signage but we follow herds of other walkers hoping that they know more than we do. It is a pleasant walk, not too spoilt by the showers, although Loughrigg Tarn is conspicuous by its absence. I am solving the leaking boot issue by judicious deployment of a Morrisons’ carrier bag; never let it be said that I don’t recycle. We head out of Elterwater and seem to be going the right way. We get as far as Colwith Force where we meet a couple from Kent who are also trying to get back to Elterwater. They even have what passes for a map, well a least a bit of one, downloaded from the internet. We don’t do too badly, notwithstanding the sudden disinclination of the footpath signposts to have place names on them. Eventually we return to civilisation and are encouraged by seeing signs for Elterwater once again; albeit the four mile walk is nearer to six. We decide not to take the route that is signed ‘Ambleside challenging’ and manage to rediscover the car without getting soaked, despite some seriously threatening clouds. The weather forecast is much more encouraging for today, promising sunshine; sadly it is wrong and it is raining again. We are fast running out of even vaguely indoor things to do but start off for Furness Abbey in the hope that it will clear up. It is nominally dry by the time we arrive and we are able to squelch round the site with only our feet getting wet. We are very impressed with the scale of the abbey, built again from red sandstone and containing some intricate carving. There is a door sill with a Nine Mens Morris board carved on it and two rare effigies of knights with full faced helms. 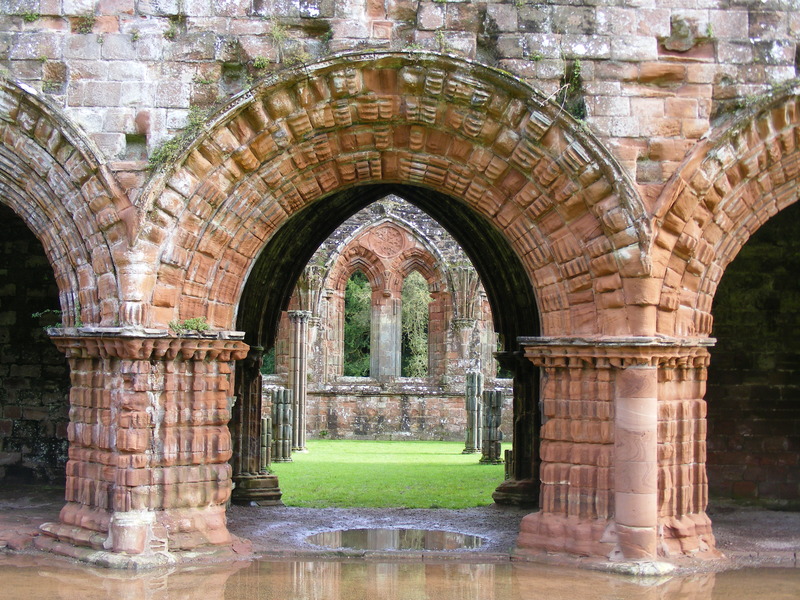 Furness Abbey is currently undergoing extensive renovation; underpinning on a grand scale. It was probably established here in 1127, founded by Stephen before he became king. The Abbey belonged briefly to the Savigniac order before becoming one of the richest Cistercian foundations in the country, with a huge sphere of influence. Its wealth was based on sheep, iron, salt and peat and its position was chosen in order to encourage the Normanisation of the area. Furness was one of the first abbeys to be dissolved, after the monks were implicated in the Pilgrimage of Grace. At the Abbey, there is a school party being entertained by ‘Brother John’, a Cistercian monk. We have long and very interesting, chat with him about the history of the Abbey, medicinal cures and historical interpretation. We walk along to see the C15th Bow Bridge then decide to return to the van via the pretty route. 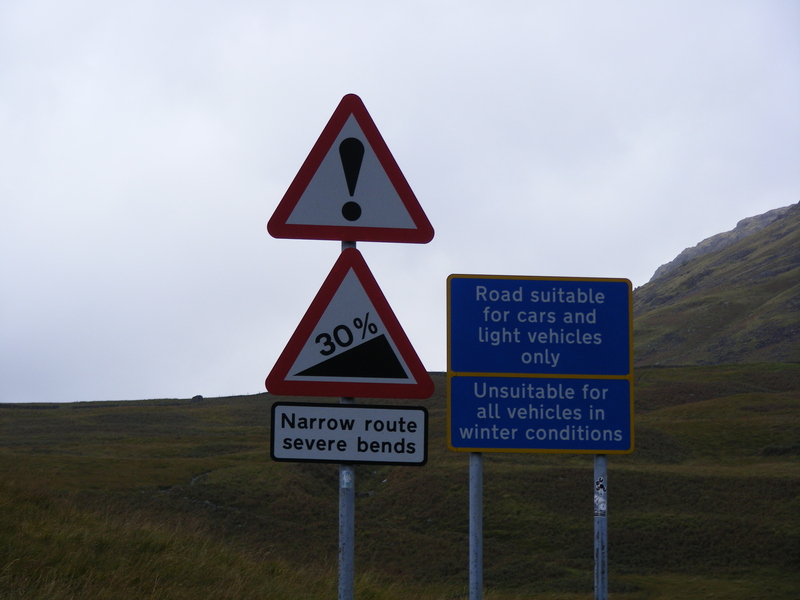 The map suggests that this will be narrow, winding and steep; it is not wrong. We wind our way up through Ulpha to the Wrynose Pass. Initially the landscape is desolate and barren with no trees. The drivers coming in the opposite direction display some interesting driving abilities and the cars appear to lack a reverse gear. Today there is a strange golden orb in the sky – hurrah. We set off, heading northwards again. 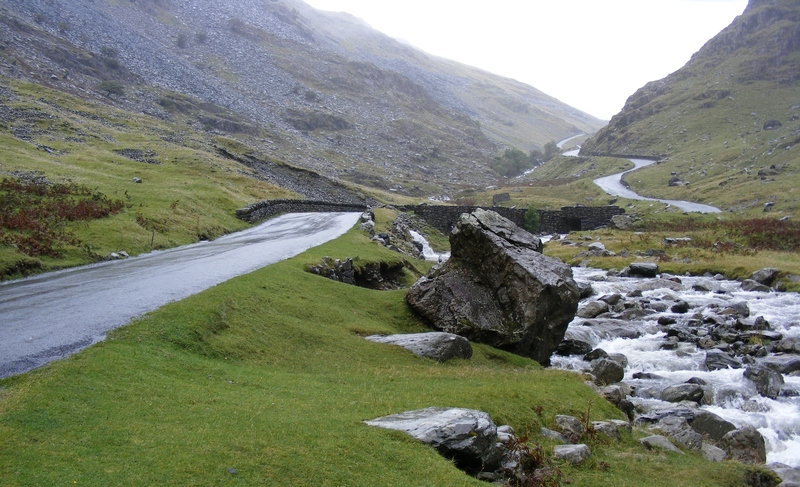 We cross Kirkstone Pass, at 1489 feet the highest road in the Lake District. It is named for a rock that is thought to look like a Church Steeple; we don’t identify this. A beautiful drive and lovely to see the scenery no longer shrouded in mist. 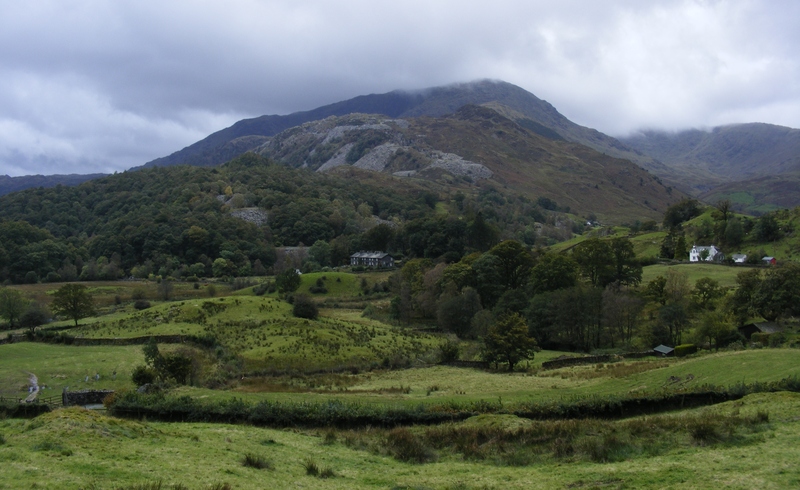 We pass Ullswater, thereby crossing off number two on the what not to miss list and stop at Aira Force, both credited with having inspired Wordsworth. Force is derived from the Viking word Fors, meaning waterfall. The rain of the past couple of days is now acknowledged as the worst for thirty years so waterfalls are in full flow. We are encouraged by the fact the we overtake quite a few people on our walk up to the waterfall; encouraged that is until we realise that the people we are passing are twenty years our senior. This land was once part of the grounds of the Duke of Norfolk’s C18th hunting lodge, Lyulph’s Tower. We reach our destination at Acorn Bank near Penrith. It turns out that the premises has no electricity today, I said it was becoming a theme. The building is constructed from red stone, which is quite common here. It was renovated by owners John and Lucy Dalston in the C17th. Dalston was a supporter of the Royalist cause during the Civil War and was subsequently declared a delinquent. He and Lucy had twenty one children. Although not historic, the gardens are noted for their collection of medicinal herbs, the largest in the north. This has obvious appeal for the Mistress Agnes in me and we admire the many species that they have. I remember I have some copies of ‘Coffers, Clysters, Comfrey and Coifs’ in the car boot, following Saturday’s course. Nothing ventured, I approach the staff with a view to them stocking it in the shop. They sound quite keen and I leave a message for the buyer. We then walk through the woods to the mill. Although the present building is nineteenth century, there has been a mill on this site since at least 1323, when it passed from the Knight’s Templar to the Knight’s Hospitillars. The SatNav takes us back a slightly different way and it has been a lovely day, even though it begins to rain again as we set off for home. We wake up to find that our new pitch is adjacent to a river. Oh, no, that would be a road. There has been incessant torrential rain all night again, although by day it eases to a persistent drizzle. There is surface water everywhere and it will test the 4×4 capabilities of Chris’ vehicle. Martha sends a message to say that 80 houses have been evacuated in Morpeth; fortunately we are not due there until next week. The local press are now reporting a whole year’s worth of rain in the last couple of days. The rivers are certainly racing and very full. There is water rushing down the hillsides in places where it wasn’t visible yesterday. We travel north towards Keswick, it was nearly Kendal owing to my poor eyesight and a slight mishap with the SatNav but I realise in time. We see notices warning us to look out for Racing Santas. Racing Santas? This is September. We don’t actually see any but who knows how long the notices have been there. We then head westwards, past Derwentwater and are now in the remote, mist clad Borrowdale. We cross Honister pass, home to the slate quarry and museum. By coincidence, this was the subject of a BBC4 television programme last night. Sadly the former owner, a risk-taking maverick called Mark was killed in a helicopter accident. The substance of the programme was the ongoing difficulty of balancing the needs of the tourist industry with preserving the natural beauty of the area. The slate clad slopes, just visible in the mist, are very impressive. I venture out of the car on a couple of occasions in order to take photos. The rain doesn’t matter as Chris has successfully glued my left walking boot in order to stop it letting in water. Last time I wore them I had to put my foot in a carrier bag first, which rather defeated the object. I discover the hard way that, unfortunately, my right boot is now leaking instead. Judging by the number of Jersey registered cars that tear past the whole population of the island are holidaying in the Lake District. We see a red squirrel which for me was almost on a par with seeing my first kangaroo in Australia. The sheep are breeds that are unfamiliar to us. Some are blue-black in colour and many have their tails intact. Others are black with white faces. We detour via Workington in order to find a Morrisons to replenish our stores and to get some petrol at a vaguely acceptable price. Despite the detour being a fairly long one it has saved us money as fuel is 10p a litre cheaper than in the National Park. All this holidaying is affecting Chris as he tries to do the washing up using shampoo. The forecast suggests that there may be less rain tomorrow – here’s hoping. There has been torrential rain all night and today is no different. We learn later that a month’s worth of rain fell today, probably all where we were. I decide against doing our washing before we set off for the day. I could probably have just hung it up outside for a thorough rinsing. As we leave the site we spot a sign for the local pub. Apparently it serves real food, that’s a relief, if a somewhat strange concept – along the lines of real ale I suppose. We drive through the Grizedale Forest, deliberately taking the pretty route to our destination and ignore the somewhat interesting suggestions by the Sat Nav. We arrive at Stott Park Bobbin Mill where we have a fascinating tour. Open from 1835-1971, it turned bobbins for the Lancashire cotton industry. 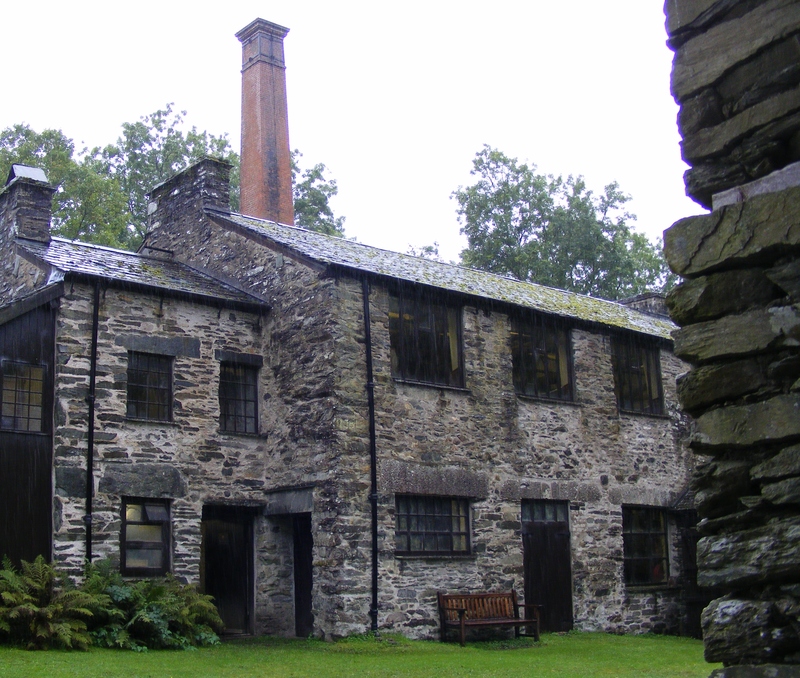 It was one of hundreds of mills in the southern part of the Lake District where the running water to power the mills was sited near wood that could be coppiced to produce the bobbins. In the hey day of cotton production, in the early C20th, twenty Oldham cotton mills required a million bobbins each to operate and these were used once only. This constituted 20% of the spinning capacity of the UK and this equalled the production in the whole of the US at that time. More recently, they produced wooden cotton reels for such companies as Sylko and which, with the addition of rubber bands, we turned into tanks in my childhood. Some of the bobbins were made from tops, poles of a similar diameter to the bobbins. Larger pieces of wood, or cakes had several bobbins punched out from each one, a little like cutting mince pie bottoms from pastry. The lathes and boring machinery, which had no safety guards, look lethal and were often worked by young boys from workhouses in places like Liverpool. As always at places like this, I think how important it is for those who have ancestors who worked here to fully understand the conditions. The deep sawdust had implications for the health of the workers so I am drawn back to my ‘How our Ancestors would have Died’ talk. The workers on the mechanised boring machine were paid a farthing a gross for their bobbins. One in every dozen bobbins was set on one side to help the worker keep his tally stick for payment. We also learnt the origin of the phrase ‘knocking off’ from work. An individual machine could be stopped without the main belts stopping, by knocking the smaller belt off to one side of the rotating spindle so that it was slack and no longer turned. We are very taken with the gunpowder barrel that is part of the display showing how coppiced wood can be used. We wonder if we can acquire one to take with us to the seventeenth century. It is unusual in that it is cylindrical in shape, rather than being wider in the middle, like most barrels. We then stop off at Fell Foot Park, Newby Bridge, which, in theory, has spectacular views of Lake Windermere. It is still poring with rain so it is a good job we have umbrellas with us. Of course they would be more useful if we hadn’t left them in the caravan. In the driving rain, we do a quick dash round to see the Lake and look forward to hot drinks, hot water bottles and dry clothes. We arrive back at the van to discover that the electricity to this part of the site is down. This is starting to be a bit of a theme. We make do on our gas for a while, then decide to move to a different pitch. This is another individual, tree lined pitch and we even have our own sheep in the wood behind us. We get away from Tewkesbury before 9.00am and the drive towards Coniston is largely uneventful. Only at the very end does our journey go a little awry and we don’t quite take the intended route. Good job we are used to narrow roads – surely this track down which the car and caravan barely fit is not an A road? It seems it is. On arrival at the site, there is a bit of an issue. I am sure we are to be here for seven nights but the site say we are booked in for eight. I check on the computer, yes we are here for eight nights – now we look like total numpties. We choose a secluded pitch at the far end of the caravan site. We are in a wooded location; already this is Blytonesque. 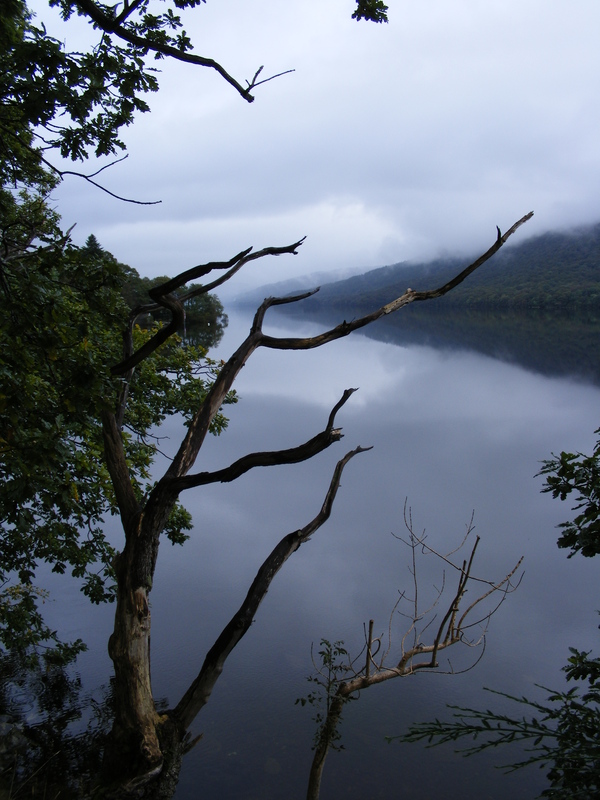 We drive a few miles through Coniston to walk round Tarn Hows, part of the Monk Coniston estate. 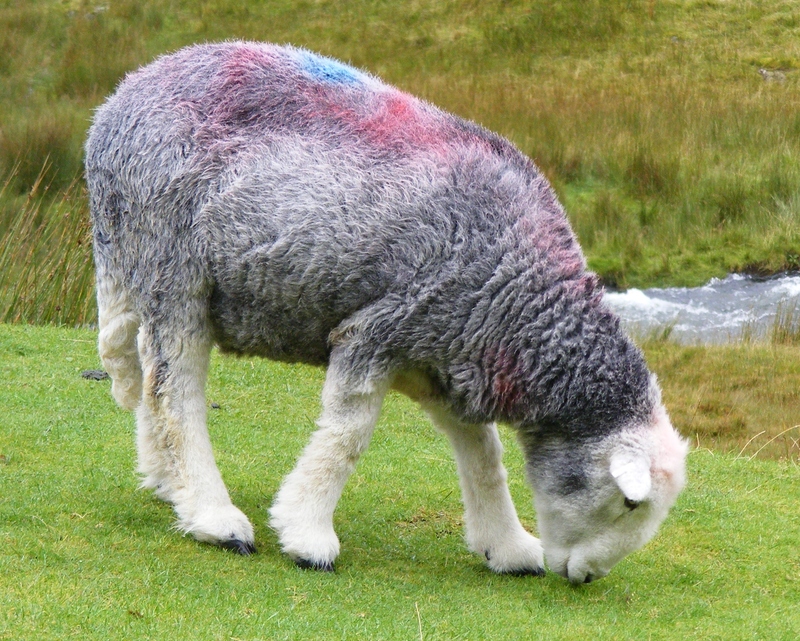 This is held out by the AA Lake District guide as one of the unmissable sights – one down seven to go. The name Tarm Hows is a remnant of the C7th-C9th Norse habitation in this area. Tarn from tjorn, meaning tear drop and haugh or hill i.e the small lake within the hills. At the view point is a large empty picture frame that you are supposed to use to surround your photograph of the view. One lady is having difficultly getting herself, her baby and her dog all in the correct position whilst her hapless husband tries to get the perfect photo. 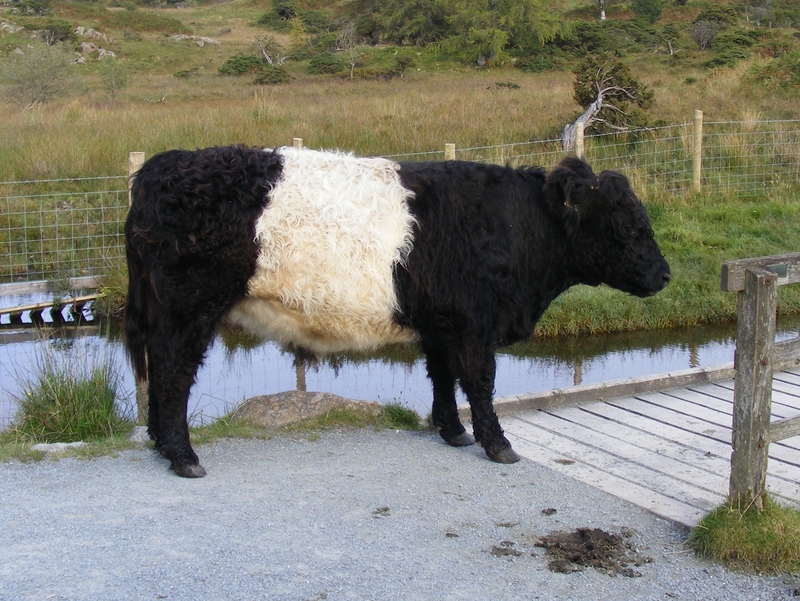 There are some fluffy belted Galloway cattle guarding a bridge that we have to cross. Feeling like a scene from Billy Goats Gruff we placate the cattle and carry on our way over the rickety bridge. From a distance, a tree appears to be covered in some very regularly distributed fungus. 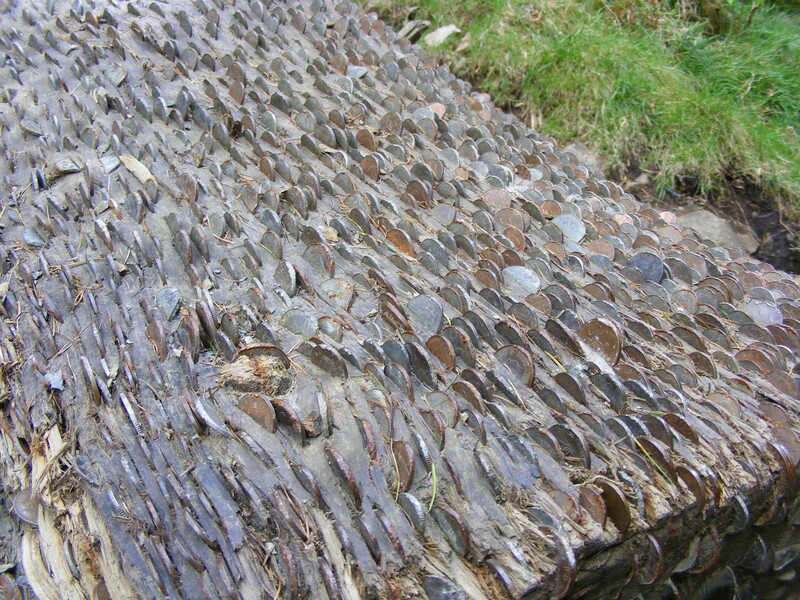 On closer inspection, passers by have inserted coins into the fallen trunk – a money tree no less. The scenery is quite distinctive, plenty of hills, water, drystone walls and sheep. The weather forecast is for torrential rain and gales with severe weather warnings – deep joy.